The WRANGLER Horse and Rodeo News is an equine and rodeo publication with circulation in Colorado, Wyoming, Montana, Nebraska, North Dakota, and South Dakota, Utah and Idaho. 64 The Wrangler, Annual Spring Horse Sale Edition • April 5-19, 2018 w w w. m u r d o c k t r a i l e r s . c o m Check our website for NEW & USED Inventory murdock trailers LQ Shells Available NOW and Ready To Convert LoveLand, Co 3550 SCR 5 I-25 Exit 254 on West Frontage Road 1-800-688-8757 AGGRESSIVE FINANCING DELIVERY AVAILABLE Ranch Ready 32' Triple Axle, High Sides stk2980 In STock ReAdy foR delIveRy! 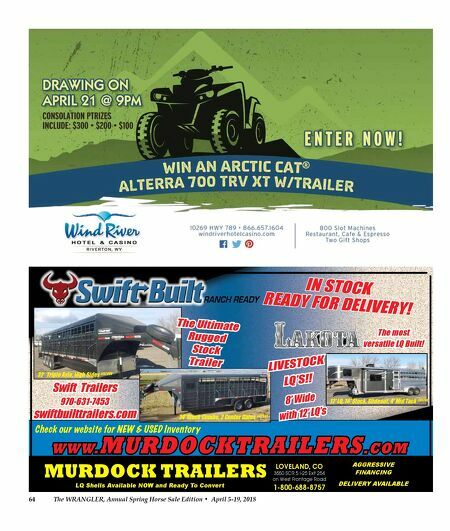 24' Stock combo, 2 center Gates stk2035 Swift Trailers 970-631-7453 swiftbuilttrailers.com 12' lQ, 16' Stock, Slideout, 4' Mid Tack stk1240 The Ultimate Rugged Stock Trailer lIveSTock lQ'S!! 8' Wide with 12' lQ's The most versatile lQ Built!